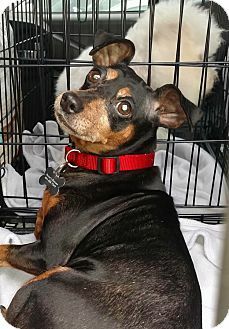 Sabrina is a darling 7-year-old purebred Miniature Pinscher. She is AKC Certified and just retired from her life used for breeding purposes. We welcome her to the rescue with open arms – and dog treats! We would love for Sabrina to enjoy the rest of her life as a loved companion, with plenty of TLC and a home to call her very own! Sabrina is a shy girl but once she gets comfortable, she bonds with people quickly. She is great with cats, other dogs and children. Her current foster is working on house training so Sabrina will need to continue on a schedule once adopted to ensure success. This sweet girl will definitely make for a great addition to any family! She will be spayed prior to adoption.